The first of two prototypes of the two-seat Hughes Model 269 helicopter flew first in October 1956, only 13 months after commencement of design work. The basic design sparked US Army interest to order five Model 269 helicopters, designated YHO-2-HU, for evaluation. As a result Hughes won a US Army contract for a light helicopter primary trainer and 792 were built as the TH55A Osage. Deliveries of the commercial Model 269A, designated Hughes 200, started in 1961. The three-seat Model 269B, designated Hughes 300, flew first in 1964. In 1969 the 300 was followed by the improved Model 269C, designated Hughes 300C. Since 1983, Schweizer has built the 269C/300C, initially under licence for Hughes. Schweizer Aircraft Corp. acquired all rights to the helicopter in 1986. In 2005, Schweizer Aircraft Corp. became a wholly owned Sikorsky Aircraft Corp. subsidiary, rebranding its popular light training helicopter as the Sikorsky S-300. In 2009, Sikorsky Aircraft announced the creation of Sikorsky Global Helicopters, a business unit made up of the manufacturer’s commercial products, including the S-76, S-92 and H-92 platforms, as well as the Schweizer helicopter line. As part of the rebranding the commercial products, the Schweizer helicopters were market as the Sikorsky S-300C, S-300CBi, S-333 and S-434. For a while, it appeared that the acquisition would revitalize the series. Instead, the S-300 more or less dropped off the map, particularly after Sikorsky shuttered the original Schweizer manufacturing plant in Elmira, N.Y. in 2010. Sikorsky tried to reduce the costs by moving toward a standardized S-300 model with a redesigned instrument panel and as a result Sikorsky discontinued the 300CBi variant of the helicopter. In 2013, production of the S-300C was resumed on a S-300C production line at Sikorsky’s facilities in Coatesville, Pennsylvania, also home to the company’s S-92 and S-76 production lines. By the end of 2014, this line was closed and final assembly was outsourced to Summit Aviation. Selling the S-300 production lines outright is considered, along with the possibility of restructuring the programmes within Sikorsky. On 6 November 2015, Lockheed Martin completed its $9 billion acquisition of Sikorsky Aircraft, replacing United Technologies as the American helicopter maker’s parent company. It remains to be seen what the effects of this merge are on a possible restart of the S-300 production. Over 3700 helicopters of the 269/300/TH55 are built, of which 2800 by Hughes before production was transferred to Schweizer. The ICAO Aircraft Type Designator for the Schweizer 269C is H269. The 1985-built Schweizer 269C c/n S 1197 was testflown as N41S. 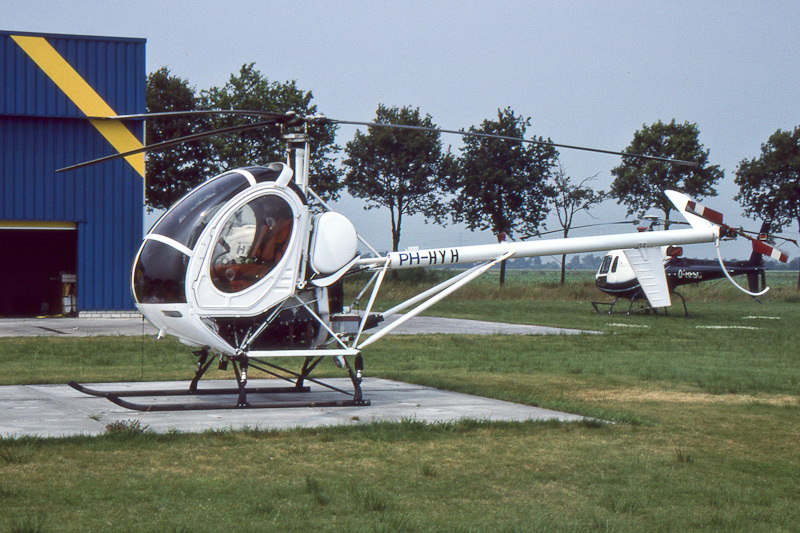 On 26 August 1985, the Schweizer 269C was registered SE-HNV in Sweden as an Hughes 269C with SAAB Helikopter AB, Nyköping, as owner. On 29 August 1986, registration SE-HNV was cancelled as exported to Norway. In Norway, the helicopter was registered LN-ORA, until registration LN-ORA was cancelled as exported to the Netherlands. On 16 May 1994, the helicopter was registered PH-HYH with Heli-Holland Holding BV, Emmer-Compascuum. On 4 July 1994, the PH-HYH was registered with Congres- en Recreatiecentrum De Bonte Wever BV, Slagharen. On 13 July 1995, Schweizer PH-HYH was registered with Heli-Holland Holding BV, Emmer-Compascuum. On 25 March 1996, registration PH-HYH was cancelled as exported to the Slovak republic. In Slovakia, the helicopter was registered OM-PII with Bel Air Slovakia. Registration OM-PII was cancelled after Schweizer 269C OM-PII was damaged beyond repair in a crash at Tornali on 15 May 1997.